The black look with the checkered flag design that can be barely seen is not a great idea. (It supposedly is an homage to the Gemini Titan rockets.) Black isn’t a necessary color to be emphasizing. And another sleeved one! 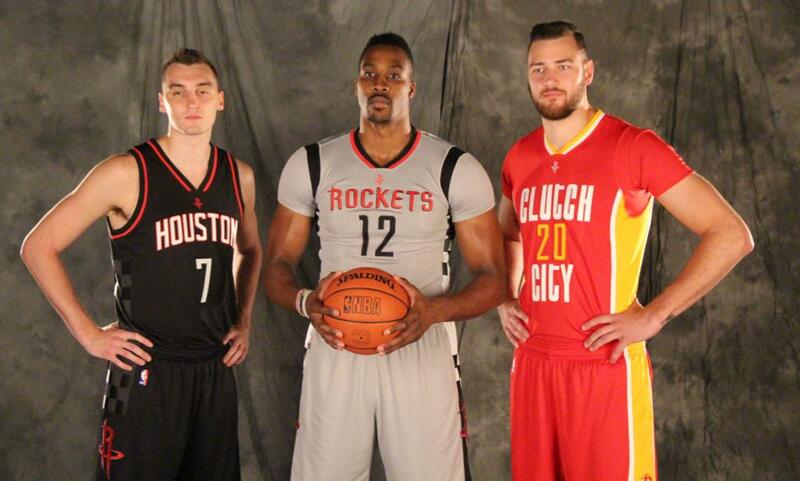 Clutch City is an OK nickname but it really doesn’t need to happen. Not like this. How odd is that these three alternates feature three different fonts? This new identity the team is going for is a mess. Terrible. This entry was posted in Houston Rockets, NBA, New Sets, Uniforms & Design and tagged Adidas, Alternates. Bookmark the permalink.